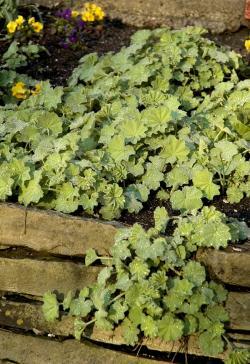 Alchemilla, commonly called lady's mantle, is a carefree plant for shady borders. Its petit dimensions and lush foliage conjure up thoughts of fairies and gnomes. Lady's mantle grows in tidy clumps about 12 inches tall and wide. Its foliage is soft and fuzzy; shaped like miniature palm fronds, the leaves grow from two to four inches across. The flowers are unusual, though not particularly showy - they appear as little greenish-yellow balls in late spring, rising just a few inches above the foliage. The plants are extremely cold hardy, but are a poor choice for hot climates. Grow Alchemilla in USDA zones 3 through 8. Alchemilla is usually planted in masses for a lush carpet in part sun locations, though it thrives in full shade on the warmer end of its range. It spreads by short runners and can be used too cascade over the edge of a low garden wall. 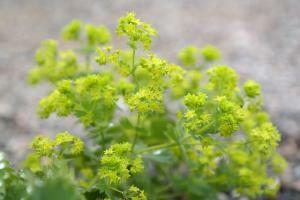 If lady's mantle is happy with its location, it will also spread itself by seed to form an extensive groundcover. It is not considered invasive, however. 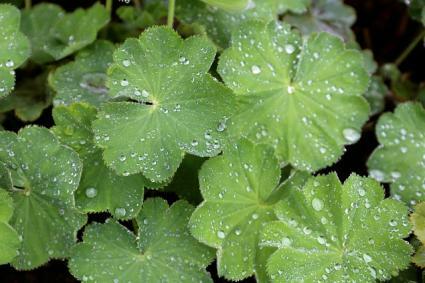 Alchemilla is widely available in the shade plant section of nurseries in the regions where it is suited to growing. Plant it in beds that have been enriched with compost in fall or spring. Lady's mantle requires excellent drainage, so create a raised bed environment for it if this is an issue. Never let the soil where lady's mantle is growing become bone dry. It will generally need to be irrigated at least once per week to remain evenly moist, which is one of the keys to keeping lady's mantle looking lush and verdant. If you want to keep it from seeding itself, simply clip off the flower stalks before they go to seed. Remove any leaves that turn yellow or brown as they appear throughout the growing season. At the end of the growing season the foliage can be cut back to the main stems along the ground, though in mild climates Alchemilla is an evergreen plant. Pests and disease aren't much of an issue with this species, though fungal diseases can be problematic in the warmest end of its growing range. If it looks shabby in hot weather, make sure the soil is moist - but rather than watering it with a sprinkler, saturate the roots from ground level with a soaker hose to avoid spreading the disease. The roots, leaves, and flowers of lady's mantle are all used in herbal medicine for various applications, like helping with healthy skin or as a herbal supplement used with Clomid. Let the plants grow for at least two years before harvesting the roots in early spring or late fall. The aboveground portions of the plant are harvested during the summer flowering period. Alchemilla is not a plant that has been bred into numerous ornamental cultivars like most landscaping plants. The wild species have such a refined look that they are the only varieties commonly grown. You may encounter plants labeled as either Alchemilla mollis or Alchemilla vulgaris in nurseries - the only difference between the two is the slightly larger leaf size of the latter species. Lady's mantle is one of those shade plants with a magical feel that can transform a shady, dilapidated corner of the yard into a lush oasis. On dew-drenched mornings water droplets collects on the velvety foliage, shimmering in the dawn's light.